Paul Kremer, "Cast 04," 2018, acrylic on canvas, 59 x 53"
Paul Kremer presents a body of large bold paintings that are given one-word numbered titles that reference the various motifs he explores. Most are executed in two or three bright colors, with Kremer severely eliminating any details in favor of strong basic forms. He achieves dynamic results by manipulating flat areas of primary color. The group titled “Cast” depicts shadows cast by light streaming through multi-paned windows. One of the more subtle yet engaging compositions is “Cast 04,” a study of white rectangles on a white ground. A group of large paintings from the “Window” series explores the interplay of blue, green and black shapes. In “Window 08” rounded colors rise and dip like a meeting of sky and earth, while in “Window 10,” the same colors are stacked irregularly as in a mosaic. 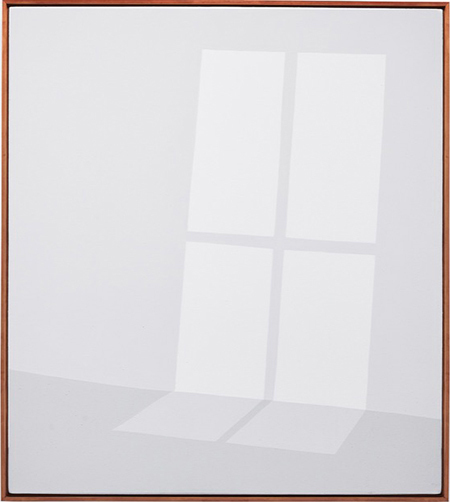 The newest pieces from 2019 are a continuation of the window as subject, although in these, one sees through the windows to what read as minimal landscapes beyond. “Float 40” and “Siren 11” resemble coastlines, with abstracted shapes suggestive of large smooth rocks half submerged and seen from below the water line. The black-and-white paintings titled “Animal” include “Animal 06,” a silhouette of a table with two objects resting on it. Another piece portrays a small three-legged table situated under a similarly shaped three-legged dog. These paintings reference some of Kremer’s earliest illustrative designs. A graphic artist by trade, Kramer is best known for “Great Art in Ugly Rooms,” a series of interior photographs in which images of well-known historic masterpieces are Photoshopped onto the walls of various unattractive environments. Displayed online initially, they garnered widespread attention and acclaim. Encouraged by an artist friend, Kremer took over his Houston studio for a month in 2015. He hasn’t stopped since.